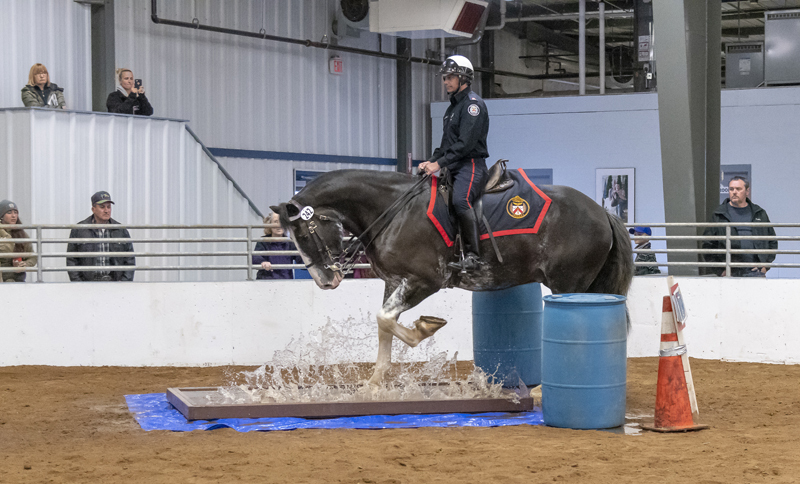 Canadian mounted police officers and their valiant steeds represented the country well at the 2018 North American Police Equestrian Championships, in Hamburg, New York. The annual event is designed to provide an opportunity for officers and their horses to put their skills to the test, displaying their trust and confidence in each other to the public they are sworn to protect. This year, about 45 teams participated from all over Canada and United States, including the Royal Canadian Mounted Police, Toronto Police Service, Kingston Police and Governors General Horse Guard. The competition includes an equitation portion, with beginner to expert classes. There is also an obstacle course, where the bond between horse and rider is put to the test. Plus, other challenges like a fleeing felon class and a uniform class, which judges the turnout of horse and rider. The Toronto Police Service team, comprised of Jeff Dale, Ryan Price and Doug McCaw, took first place in the obstacle course, with Dale as the individual obstacle course winner as well. Go to napecinc.org to learn more.